The Heritage Center’s internship program has brought young people from all over the Reservation and even all over the world to learn the behind-the-scenes work that goes on at this unique institution. 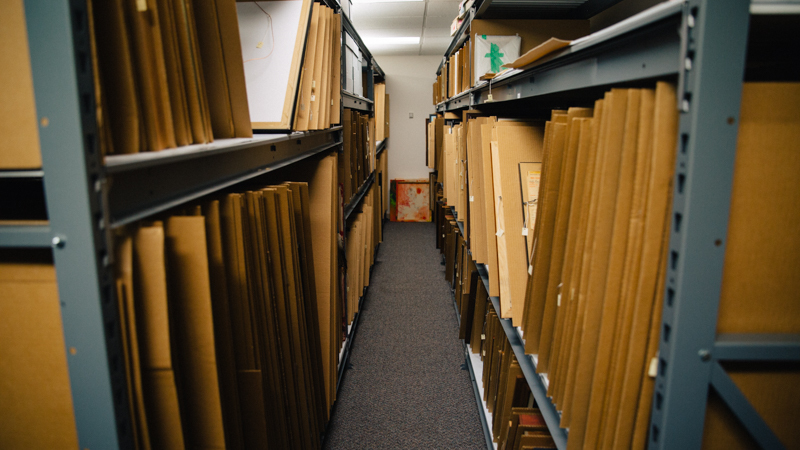 From the repetitive task of entering data to the creative challenge of helping conceptualize and curate a new show, the interns learn about all sections of this art museum’s operations. In this reflection, Luz considers her time at The Heritage Center and all she learned working side-by-side with Curator Ashley Pourier. I wanted to come work at The Heritage Center because I am passionate about art and education, with a willingness to learn, take leadership, and grow. Some of my initial projects were database entry, handling art pieces, and creating lesson plans. I especially liked working in the gallery. But as the summer went on, my questions about the nuts and bolts of what happens in the museum began to emerge. And I was able to have those questions answered by Ashley Pourier, the Curator of The Heritage Center. Wandering the gallery, I wondered how Ashley organized it in such a way that the viewer’s gaze can easily go from piece to piece. I was curious about the process of organizing pieces in the museum. Ashley mainly takes into account the size, weight, and shape of artwork. This helps with finding places where the pieces will physically fit. Next, she takes color and contents of the pieces into consideration, to direct the gaze of the viewers. Working with art in the gallery was mostly intuitive for me, from carrying the art in such a way that it wouldn’t be damaged to packaging and wrapping the art so it would be safe. As I was moving some of the work, I thought about how the curators decide what is brought out into the gallery. The gallery tends to have a theme when pieces are put on display, but sometimes there is not enough artwork which obviously fit into the theme. If that happens, some research is done to find art which has more subtle connections to the theme. Shows can be simple or complex, from highlighting humor in the art to the size of the artwork itself being a theme. Looking through the Summer Art Show before it was open to the public, I noticed there were already several red dots scattered around the gallery, signifying some of the pieces had already been bought by the curator. I wondered how Ashley decided the pieces that would be chosen to become part of the permanent collection since there were so many brilliant pieces of art. I learned that there are two primary ways that artwork becomes part of The Heritage Center’s permanent collection. When the museum has a budget to buy pieces with, it will purchase artwork selected by the staff. 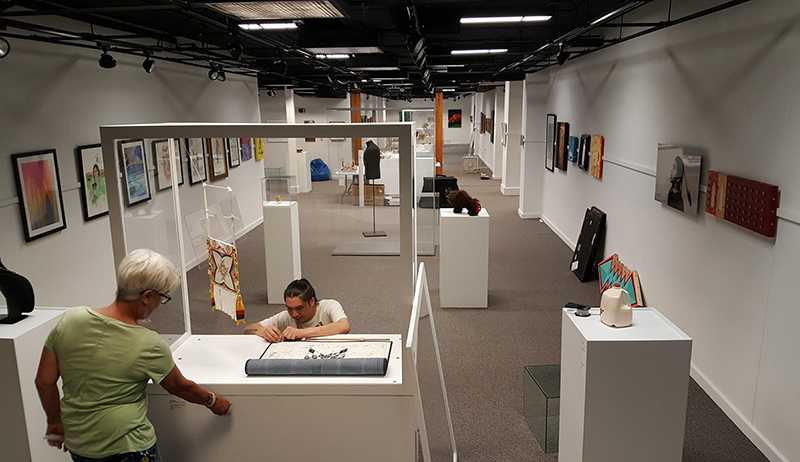 The Heritage Center often chooses to support living artists, especially younger artists, to encourage them to continue with their careers. The museum also looks for pieces to fill in gaps in a certain artist's line of work. The other way art enters the museum is through donations. Donations are presented to the acquisitions committee, and members have the final say if the piece will be kept or relocated. My last question was how the judges decide who gets the various awards in the art show. That question doesn’t have a simple answer since most judges tend to have their own individual methods for choosing award-winners. So my question became, how does The Heritage Center select its judges? I learned that judges tend to be chosen based on their knowledge of Native cultural arts and Native history. Curators do not have a say in a judge’s decisions, although they will answer questions about artists if a judge is having trouble deciding among several candidates. That said, the winner of the Brother C.M. Simon Award, which appears in the poster announcing the following year’s show, is chosen by both judges and curators. Aside from particularly outstanding pieces, most artists won't receive more than one award, so that support can be shared with many different artists. 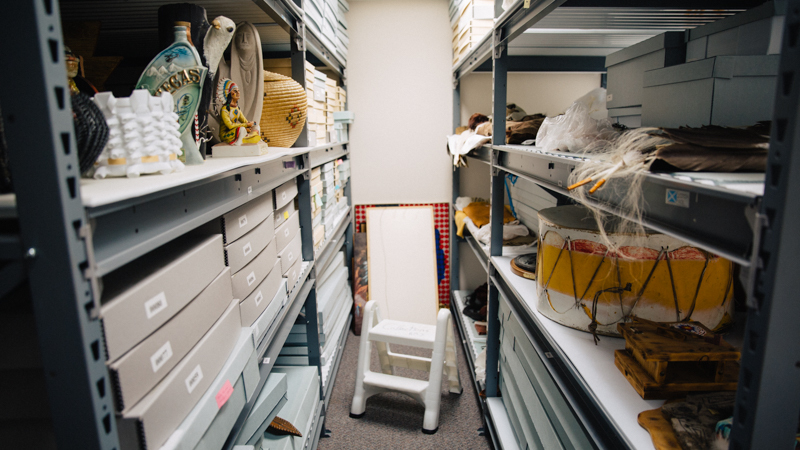 With more knowledge of the nuts and bolts of The Heritage Center’s work, I now have a better understanding of the behind-the-scenes processes of a museum, from the way curators organize artwork to guide a viewer’s eye, to the care and thought put into organizing the pieces shown. I feel I have more insight into the art world and I am better prepared for any future careers in it.